Max Summerlee and I get another chance to catch up. Timestamps available in the Youtube page description. With the end of the World Championships in Innsbruck, the 2018 bouldering season has officially come to a close. It also marks the end of the first season of my Canadian Boulder Rankings, which began last September and was finally published in January. I built this ranking system because I love how rankings and ratings can build narratives for competitions. It also makes it easier to track the bigger picture across a season: individual results from a single event can be affected by a huge range of factors, and I find it difficult to remember who was injured, who was in Group A or B, or who just claimed they “had a bad day.” Taking information from every event and putting it all together helps to round out those outliers, and gives a reasonable fair summary of each athlete’s performance. I wanted to reflect a bit on how the season played out within the rankings, and I want to share some insight on some new things I may try to make the system even better. Alannah Yip and Sean McColl earn the #1 spot in the PW Canadian Boulder Rankings for the 2018 season. Photos courtesy of the IFSC. Alannah Yip and Sean McColl are the “winners” of this first season of these rankings. McColl never actually secured the #1 spot until his win at CEC Nationals, as that was the first time he bouldered against a fellow Canadian since the 2017 Munich World Cup. McColl’s underperformance at the World Championships briefly left the door open for Jason Holowach to overtake him in points, but it wasn’t enough to overcome McColl’s international season. Conversely, Yip held #1 through the entire season despite her loss to Allison Vest at CEC Nationals. That painful defeat was nullified after Yip fought to become the top-placing Canadian at every World Cup she attended. These champions are logics winners, and I believe most spectators would come to the same conclusion if they were asked for their “top Canadian boulderer of 2018.” In reality, there are still a lot of factors within this ranking system that would appear inconsistent with normal logic: namely, the huge importance this system places on attending events. 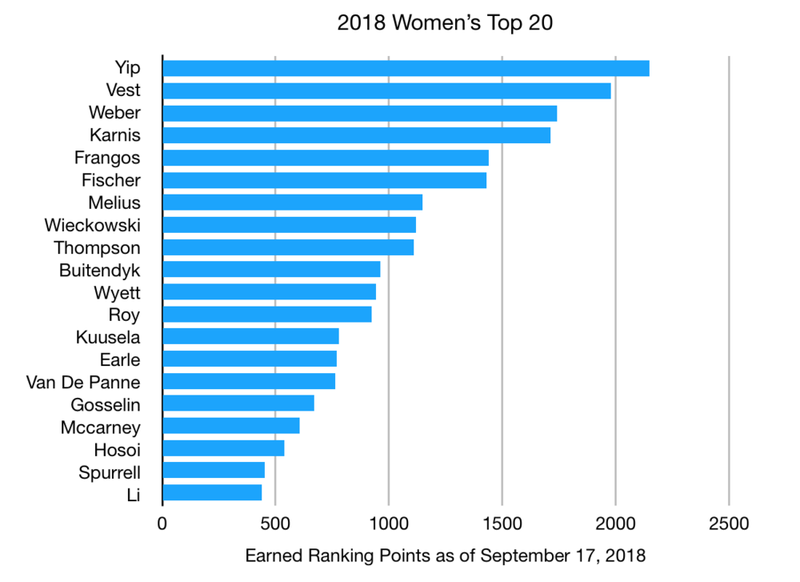 Any athlete can increase their scores by attending more events, and a great example of where that has caused the rankings to directly contradict results is between Bronwen Karnis and Alyssa Weber. Weber attended both the CEC National Series event in British Columbia and Alberta this season, earning ranking points for winning both events against other strong competitors. Karnis only attended the Ontario event, earning points for her win but still coming away with only about half of what Weber earned because of competing in one fewer event. In the end, Weber ends the season with more points and a higher rank than Karnis, even though Karnis has outperformed Weber every time they’ve met over the last two seasons (CEC Nationals 2017, CEC Nationals 2018, Vail WC 2018). I mostly accept these flaws because a) my system doesn’t have much flexibility to adjust for them without creating a huge amount of extra work, and b) because the Canadian competitive season is constantly changing. For 2019, National Series events will no longer exist and a replacement system will likely be debuted by the CEC in 2020. In addition, the once-pervasive Tour de Bloc continues to shrink, and prize-rich “local” events like Bloc Shop Open are growing and may coalesce into an informal “national circuit”. In the future, there will likely be a circuit of events that are evenly distributed across the country, and hopefully increased prize pools will contribute to more head-to-head opportunities for Canadian athletes. Until then, I’m not very motivated to try to artificially balance the calendar when everything is constantly changing. The value of events will continue to be based on how many other top athletes are competing, and by the quality of the format. Starting Monday, a new season will begin with results from Bloc Shop Open, The Brawl in the Fall, and maybe a few others. Climbers like Sean McColl will inevitably see a drop in their rank as they focus on other disciplines, and as lesser athletes earn points by competing through the entirely of the local/provincial circuit. This throws the top athletes under the bus for a while, but it makes it easy to spot up-and-comers. Rookies for the upcoming season were born in 2003, and one or two these young guns could make a big impact on the top 20. My dream ranking system would look at head-to-head results across every athlete, and across every individual boulder. Starting with Bloc Shop Open, I’ll be tracking event results across each round individually (qualifiers, semis, finals). This will give up to 2 more opportunities per comp to compare the best athletes, which will hopefully create a more accurate ranking. I still need to determine how the point values will break down when compared to comps that don’t provide a round-by-round breakdown, but this whole thing is in beta so occasional tweaks are the norm. Anyway, I’m looking forward to running this system through a full season with an even stronger crew. Hopefully we’ll see names like Elan Jonas McCrae, Elise Sethna, and Eric Sethna return to the scene. A system like this gets even more valuable when comparing athletes across entire seasons, so I’m excited to tell even better stories a year from now! Alex Honnold is our secret social media influencer, rope walls are the best place for boulders, and backfilled autobelays work better when you don't put any effort into setting them. Max and I work for competing gyms that are just 15 minutes apart, so our conversations are always a mix of busting each other's balls and comparing notes about our local gym scene. Thanks to Maxwell Summerlee of Basecamp Climbing for trying out a new idea with me. Romain DesGranges, Sean McColl, and Adam Ondra were the centre of attention after some unfortunate foot placement during the lead qualifier of the 2018 World Championship in Innsbruck. Climbing walls have been littered with obstacle for a long time, but it's not acceptable to see the world's greatest athletes eliminated because of something so preventable. What can we do to make sure no climbers ever run into an issue like this again? Also check out Ep. 8 - Making Better Setters, Part 1: Dustin Curtis to see photos of his mobile setting workstation.